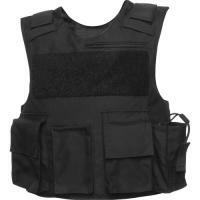 GH Armor Systems SIZING-TOC.F, SIZING-TOC.M TOC Tactical Outer Carrier FREE SHIPPING! The GH Armor Systems Tactical Outer Carrier is designed to provide high-level protection and versatile storage space, making it extremely valuable for tactical operations. It is made from durable 500 denier Cordura nylon, and equipped with a moisture-wicking lining that keeps you cool and dry. Its internal cummerbund and adjustable side and shoulder closures provide a secure, movement-free fit. The front features an 8 by 10 and a 5 by 8 inch trauma plate pocket, compatible with all GH concealable panels. Their internal suspension systems guarantee proper alignment and prevent the plates from sagging. The front also features multiple accessory storage compartments, including a 6 by 6 inch utility pocket, a triple magazine pouch, and pockets for a radio and flashlight, as well as a hidden all-purpose chest pocket. Further storage space can be found on the rear, including a dual handcuff pocket, while microphone loops on each shoulder provide a stable mounting point for your communications gear. It's still a bit large for my frame, and wished I'd invested in a interchangeable pocket system. It's a decent piece of gear though. Vest is custom made. Sizing forms will be emailed upon ordering. I want to know if this vest is in stock and if it isn't how long will it take to come in. You will need to fill out a sizing form once we receive your order. Interested on purchasing, but how do I select size? There's no drop menu for size selection. This is a custom made item and once ordered a sizing form is sent to you via email for you to fill out with your measurements. ©2002-2019 CopsPlus.com: GH Armor Systems SIZING-TOC.F, SIZING-TOC.M TOC Tactical Outer Carrier FREE SHIPPING!